Wisconsin Gov. Scott Walker on Tuesday became one of the first 2016 Republican presidential candidates to detail a health care plan, heavy on tax credits, that he would use to replace the Affordable Care Act (ACA). Speaking in Minnesota, Walker detailed his "Day One Patient Freedom Plan" that promises a full repeal of Obamacare, affordable health insurance, more empowerment for the states, innovation and financial stability. "On my first day as president, I will send legislation to the Congress to once and for all repeal Obamacare entirely and then along with it we're going to replace it in a way that puts patients and their families...back in charge of their health care - not the federal government," Walker said. He said he would achieve the first step - a full repeal of the ACA - by forcing Congress to "live under the same Obamacare rules" as Americans and issuing an executive order that "gets rid of the deal" that allows lawmakers to avoid using the program. "That's going to light a fire under Congress," he said. Ted Cruz to sign up for Obamacare? However, an amendment to the ACA, which passed in 2010, already requires lawmakers and some of their staffers to purchase their coverage through the law's D.C.-based exchange if they want to receive a subsidy. Iowa Sen. Chuck Grassley, the Republican behind that amendment, said members of Congress "need to go into the exchange so that we would have to go through the same red tape as every other citizen." If Walker's plan were to pass, there would no longer be a mandate that all Americans purchase health insurance. Instead, Walker would provide tax credits to anyone who does not have employer-sponsored coverage. The credits range from $900 to $3,000 based on an individual's age. Individuals who sign up for a Health Savings Account (HSA) would also receive a $1,000 refundable tax credit and he would raise the limits on tax-free HSA contributions. Walker argued that by eliminating red tape and increasing competition, his plan would lower premiums by up to 25 percent. One of the regulations he would lift: a prohibition on buying insurance across state lines. He promises "additional reforms to insurance coverage laws" to protect individuals with pre-existing conditions from losing their coverage and also says the federal government would provide funds to help states provide coverage and allow them to manage high-risk pools. He would break up Medicaid into smaller programs, including assistance for low-income families, and separate programs to provide acute care and long-term services and support to people with disabilities and low-income seniors. States would receive specified contributions and be allowed to keep any savings they achieve without forfeiting federal funds. Walker's proposals for innovation include lawsuit reform, allowing consumers to pool together to purchase insurance - he offered, as an example, a group of farmers - and support for wellness incentive programs. All in all, Walker says, his plan will not add to the deficit and portrayed his program as a trillion-dollar tax cut because of the complete repeal of the ACA. "It's all about freedom, it's putting freedom back in the hands of patients and families to make decisions about your healthcare and your money," he said. He spent the last several minutes of his speech reminding voters that he is one of the only candidates who has released a detailed proposal for reforming health care. "For a lot of folks it's a good punchline in your speeches out there on the stump. 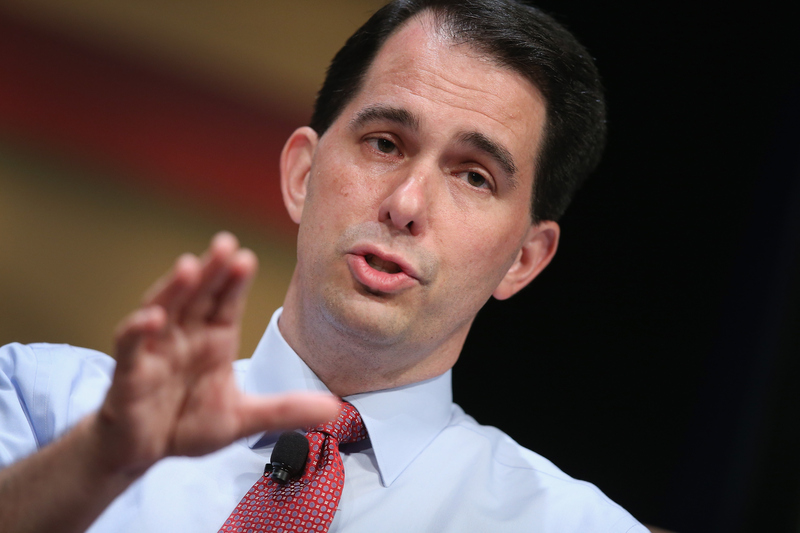 We've actually got a plan to give to the American people," Walker said. "We don't just talk about things. We fight, we win, we get results and we do it without compromising our commonsense conservative principles."